Your to-do list is still full. Instead of working on getting things done, you sit there. Mindlessly scrolling through your Facebook or Instagram feed while on your fourth episode during your Netflix binge, you have yet to get up. There’s a house to clean or a project calling your name. Maybe you have a paper you should be working on for school. So you tell yourself, after the next episode, after I take my nap, or in just ten more minutes. Another excuse with nothing accomplished. You have goals. You know the steps to make your next step a reality, but you’ve allowed procrastination to take up residence in your life. It’s there whether we realize it or not. Putting off doing difficult things may seem easier at the moment, but it comes at a hefty cost. We can experience guilt and increased stress knowing we have more work to complete. In addition to these negative emotions, procrastination can even lead to a poor reputation with our family, friends, and coworkers because we are continually inconsistent. When we accept procrastination as our normal, we devalue our time, gifts, and purpose. Inaction becomes a way of life. Fortunately, we all can choose to move forward at any time. 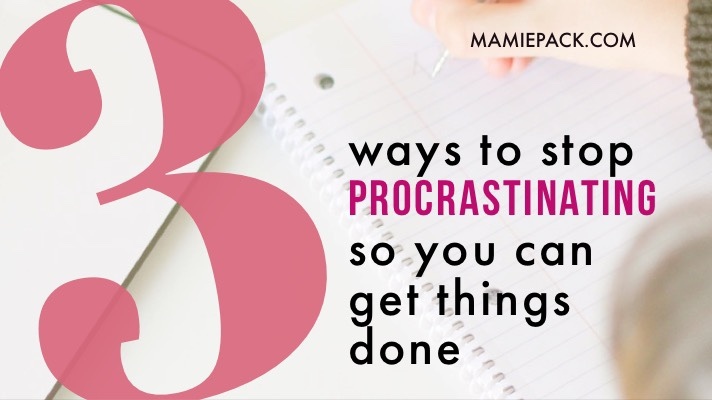 Moving past procrastination is easier to do when you decide to take these three steps. Perfectionism creates the idea that every environment, every page, every word must be just right. If we continue waiting until the perfect “time” to tackle our tasks, for the perfect “look” before we submit the project, or the perfect “space” before we start the business, we have allowed perfect to prevent us from moving forward. We start just to stop just to start all over again completing NOTHING. That’s why we must learn the difference between working with excellence rather than working to make everything perfect. Perfection says everything has to be just right. Excellence says I will do my best. Perfectionism says I cannot make mistakes. Excellence says I will take ownership of my mistakes and learn from them. Perfectionism defines who we are by what we do. Excellence says who I am defines how I work. Working in excellence provides the freedom to move forward, try new things and embrace growth. Using calendars and making lists can help with tackling those activities we want to avoid. Even though procrastination can stem from perfectionism, it can also happen because we have too much to remember and we have stretched ourselves too thin. Using a calendar helps to identify how we are using our time. When you get up? When do you have time to work on the project? When can you work on starting your new business? Where are you spending most of your time? Is it running the kids back and forth to activities? A calendar can help to identify if you are overextending yourself. You may see that Monday is overflowing with work and family commitments leaving little time for rest or self-care. Once you determine your obligations, you can make decisions on how you can effectively use your time and plan efficiently. Yes, I know this is not what you want to hear. I get it. Putting off the challenging aspects of our day is easy to do. When managing your bills stresses you out, you might want just to wait to do them. You have a big paper that is going to take up most of your day, why not wait to do it after you have a little fun? We all have creative reasons why the project can wait, why we don’t need to make the call, or even why we should have a difficult conversation later. When we choose to tackle the hard thing, we are no longer bound to the fear. Most people avoid doing the hard things because of fear, most importantly fear of failure. I don’t like managing money. I’m not good at it, so I put off handling the bills. I have never been good at writing, so I will write my paper later. I don’t want to hurt her feelings or be misunderstood, so I will put off having the conversation. Don’t allow fear to keep you from moving forward. Instead, pray! Allow the Holy Spirit guide you and seek help. If you struggle with writing, get a tutor or ask your professor for help. If you don’t do well managing money, find someone who can provide financial coaching. Just move! What will you do today to stop procrastinating and get things DONE? The perfectionist vs excellence is right on time. I thank God for this post. I think this is exactly what I have been struggling with. I have truly been stressed about things not being how I want them but been putting off fixing them and I think this is why. I am so glad the Holy Spirit was able to minister to you through these words. Don’t put off what God is calling you to do. Move forward!!! I agree with Lacole. I needed this message today! So glad you enjoyed it lady! This was helpful. Thank you for writing this post. I have been reading self help books lately, they resonate with your post. Oh, that is great. Any particular books you are reading? This was really helpful. Doing the hard things first and getting them out of the way definitely works for me. Great inspirational post. I think the best tip and one im personally challenged by is to get the hard things done and out of the way first! That way its easier to do the rest. Those hard tasks are challenging for sure. But when you knock it out everything is simply after that. I really appreciate the Perfection Vs. Excellence chart!!! I always do the easy things first so that I can see more things checked off the lists and then it encourages me to keep going. I should try tackling the hard thing first one day and see how it goes! Thanks for a great post! Tackling the hard thing is not as popular but it is worth trying. You are more likely to complete it first when your mind and energy is fresh. I think you are inside my brain. I am intentionally making lists and setting daily goals. This has been life changing! Love it! Intentional is one of my go-to words. I love the idea of excellence over perfectionism. I struggle with this a lot. Also, writing things down is my lifesaver to remember all those little things that I will forget about. Great post!